What do a screen porch and the perfect outfit have in common? Have you ever seen someone that makes you comment that they are “incredibly well put together”? When we see these people, we don’t just mean that they have a great outfit. We don’t just mean that their hair looks just right. We don’t just mean that their accessories match. What we mean is it all works. And it all works together. We know this from decorating the rooms in our house. How many of us have bought that perfect new bed or perfect new bedding set only to realize that they look totally out of place with the rest of our existing furniture or with the style of the room? One of the very first questions customers ask me when they’re looking for a new screen porch is can I make it compliment their home. The simple answer is yes. It can compliment your house. There are a number of factors that go into making this end result happen. This home has both a gable roof and a shed roof. The shed roof matches the shed roof above it. One of the biggest factors to matching your screen porch to your home is the roof style. If your home has a gable roof, it is ideal to try to use a gable roof with your screen porch. The reason I say ideal is that sometimes the window placement or other factors on the back of your house do not support a particular roof style. For example, if we want to build a gable roof and the height of this roof extends vertically up to the second floor, there can’t be any windows or doors or other architectural features on that adjoining house wall as we can’t have the porch ceiling obstruct the view from second story windows. In this case, we may likely need to choose an alternate roof style. Sometimes choosing a roof style is even more complicated. Your house may have two or even three roof styles. You may have a gable roof along with a hip roof and possibly even the addition of another roof style. 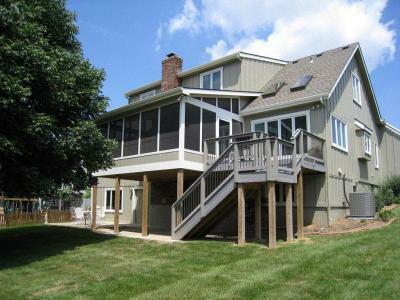 This allows more flexibility in choosing the roof style for your screen porch. As you can imagine, the roof style can make the price vary quite a bit. 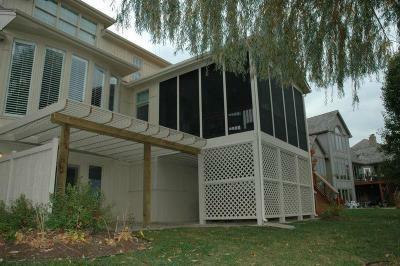 Scale is very important when designing a screen porch to match your home. If you have a huge screen porch with a smaller home or a tiny screen porch with a larger home, the simple scale of the two will not compliment the home the way you wish. What kind of footprint is in the back yard? There might be jogs and jigs where the kitchen or other rooms jut out. Look at how the shape of the porch will compliment these. Is there any landscaping, trees, or things you don’t want to move? 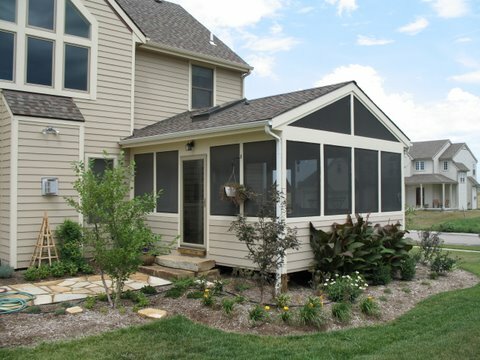 All of these elements help dictate how we can design the screen porch to match your home. Does your home have a particular type of siding? What color is it? Matching the exterior of your screen porch with the materials from your home’s exterior is a huge factor. In this picture, you will see a number of elements that aided in matching this screen porch to the home. You will note that the gable roof matches the gable-shaped window set on the back of the home. The porch trim matches the trim of the house. And, the siding on the kneewall matches the siding on the house. 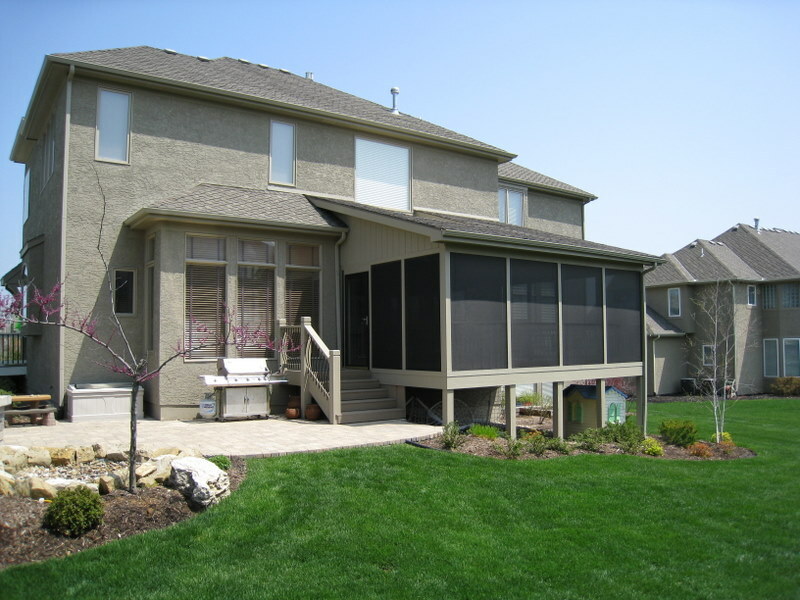 Based on the elevation of your back yard, you may need an elevated screen porch. 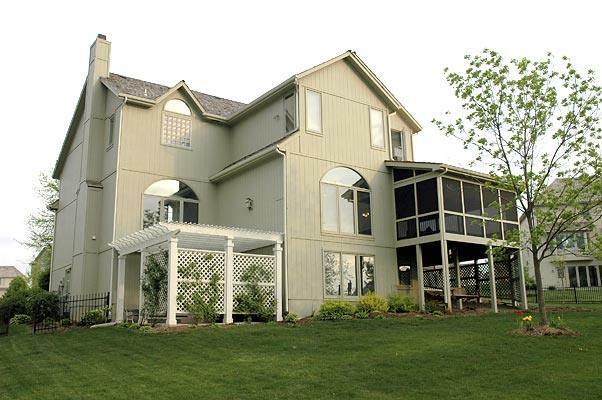 See how this screen porch in Overland Park is elevated to match the home. You will also notice that no knee wall is used so the elongated vertical screen shapes match the elongated vertical windows of the home. There are ways outside of your screen porch design to blend your porch into your home. Landscaping has a big impact on blending something with your house. What it tends to do soften the lines of any addition whether deck, porch, etc. and makes it flow better into your yard’s footprint. To read more in our article series on screen porches, here are a few more. Is the inside of every screen porch the same? Screen porch or sunroom? Here are some things to consider. Please visit our screen porch photo library on our Archadeck of Kansas City website. This entry was posted in porches, Screen Porches, Screened porch and tagged Archadeck of Kansas City, screen porch builder Kansas City, screen porch contractor Kansas City, screen porch Kansas City on September 20, 2011 by archadeckkansascity.